Archbishop Timothy Dolan of Milwaukee will be taking over for Edward Cardinal Egan, who is retiring after nine years as NYC's top-ranking Catholic. The installation of New York Archbishop-designate Timothy Dolan will be a two-day event at St. Patrick's Cathedral celebrated by thousands of well-wishers ranging from Dolan's second-grade teacher to the Vatican's U.S. ambassador. Dolan, 59, the former Milwaukee archbishop, is taking over the most visible American job in the Roman Catholic Church and the nation's second largest diocese after Los Angeles. 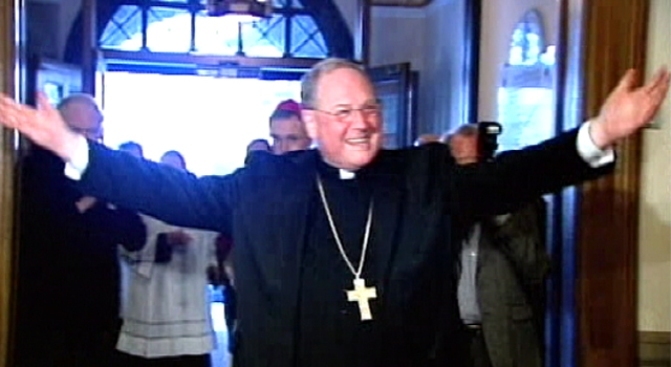 Edward Cardinal Egan, 77, is retiring as New York's archbishop after nine years of service. Tomorrow's Mass of Installation makes Dolan's tenure official, but during this evening's formal prayer service at St. Patrick's, he'll give the homily during the Solemn Vespers. 8:14 p.m. -- The recessional hymn, "I Know That My Redeemer Lives," has concluded. Archbishop Dolan has invited those in attendance (except for press!) to a reception at the Catholic Center on First Avenue. He's doing some waving, picture-posing and schmoozing here (at St. Pat's not on this blog) first. Tomorrow, he'll meet the media, become officially installed as New York's 10th Archbishop, and preside over Mass. I'll continue the blog from the Installation Ceremony tomorrow. Have a good night! 7:59 p.m. -- A quick point of clarification. Timothy Dolan does not *officially* remove the "Designate" in front of his title of Archbishop until tomorrow, when the letter from the Pope is signed and notarized by the Chancellor of the Archdiocese. Make no mistake, that letter is here now; and everyone here (including priests) now refer to Archbishop Dolan as Archbishop Dolan. (What else would we call him, he was Archbishop in Milwaukee) But the College of Cardinals will not officially recognize him as such until tomorrow. By the way, the homily is over, and it is now time for more prayers, hymns and the closing ceremony of Solemn Vespers. 7:48 p.m. -- A poignant moment from Archibishop Dolan's homily. He turned to the hundreds of priests gathered around him at St. Patrick's. "I thank you, brother priests, for continuing to be agents of the divine invitation, and to you I pledge my life and love!" 7:36 p.m. --More from the Archbishop-designate's speech, which has now begun: there's no doubt about it, he's a sports fan! "I'm still angry at New York for taking Favre and Sabathia from us in Wisconsin! The Yankees and Mets over the Cardinals and Brewers? Forget it!" 7:29 p.m. -- Sort of breaking news! I've been handed an advance copy of Archbishop's Homily, which he's set to deliver shortly. It's his welcome-to-New-York-moment. "Thanks for already making me feel at home! Thanks for letting me into your lives!" he exclaims, according to the prepared text. 7:24 p.m. --The Archdiocese has handed out 28-page glossy handbooks to the Solemn Vespers ceremony. The front section is photos. Pope Benedict, Pietro Nuncio-- the Apostolic Nuncio to the U.S. (and the Pope's representitive at this ceremony), Archbishop Dolan and Cardinal Egan. The rest of the booklet includes lyrics to the hymns and psalms. 7:10 p.m. -- The line of the night, from Cardinal Egan to his successor: "Archbishop Dolan, I can assure you that's the last time you'll have to knock twice to get into St. Patrick's." 6:59 p.m. -- Well, he knows how to make an entrance. Following tradition, Timothy Dolan knocked (with a ceremonial-type hammer) six times. When he didn't get an immediate answer, he smiled and knocked three more times. All of St. Pat's laughed. Then Bishop Dolan entered, to a round of applause. Now Cardinal Egan has officially welcomed him as the 10th Archbishop of New York. 6:21 p.m. --Joe Zwilling, who has been a spokesman for the Archdiocese of New York for 27 years, described Timothy Dolan as "extremely relaxed" around the media. The new Archbishop faces questions tomorrow morning at a 10am News Conference at the Catholic Center. "He'll keep me busy," said Zwilling of the media-savvy Dolan. 6:12 p.m -- The Cathedral is now about two-thirds full of invitation-only guests. 6:03 p.m.-- The Cathedral of St. Patrick Choir has assembled, and they just started singing, what's known as the "Prelude" to the Banner Procession. A quick word about technology-- you'll recall from my previous post that these installations are rare occasions. 2000-- at the installation of Edward Cardinal Egan-- Rudy Giuliani was Mayor, Bill Clinton was President, and Facebook and Twitter didn't exist yet. 1984-- at the installation of John Cardinal O'Connor, Ed Koch was Mayor, Ronald Reagan was President and nobody knew what e-mail was. Or had a cell phone. 5:49 p.m. -- How rare is the installation of an Archbishop? Well, Dolan's is the first in New York in nine years. And that's after Edward Cardinal Egan held the position for the shortest time of anyone this century. John Cardinal O'Connor served 16 years. Before him, Terence Cardinal Cooke served 15. And prior to that, Francis Cardinal Spelman headed the New York Archdiocese for an astounding 28 years. 5:41p.m. --. A delicate matter, briefly touched upon: once the Solemn Vespers begin, there's no leaving your seat. Joe Zwilling, spokesman for the Archdiocese of New York, had this advice for members of the public who feel the need to answer the call...of nature. "Saks," said Zwilling. "We tell people to use the restroom at Saks across the street." 5:23 p.m. -- I've moved a few rows back, to the St. Andrew Chapel section of the Cathedral. I have a better direct view of where soon-to-be New York Archbishop Timothy Dolan will stand. And I can still see the public pews. Better blogging to be had. One photographer here, referring to the media barrage facing the new Archbishop, who previously served in Wisconsin: "this ain't Milwaukee." 4:20 p.m. -- Good afternoon. Well, I'm officially first in line at the media entrance to St. Patrick's Cathedral on 50th Street. It's raining, but fortunately, giant scaffolding is keeping me dry. The NYPD has built some tall fences for extra security at every entrance to the church. I'm told reporters will be allowed inside starting at 5 p.m.